art.earth (in partnership with Plymouth University's Sustainable Earth Institute <http://Plymouth%20University's%20Sustainable%20Earth%20Institute> and Science Walden <http://sciencewalden.org/> at Ulsan National Institute of Science & Technology <http://Ulsan%20National%20Institute%20of%20Science%20&%20Technology>) invites you to submit a proposal for participation in the forthcoming summit Adorning our new biosphere: how to love the postcarbon world <http://postcarbon.world/> to be held November 7-9 at Dartington Hall, Totnes, Devon TQ9 6EA, UK. This event is another in a renowned series of international symposia held at Dartington in the southwest of England. In our emergent post-carbon world, what of justice? what of beauty? What of art itself? Surely the artist’s ability to stir up and question societal thinking, challenge preconceptions, and assert new forms of beauty and aesthetic reasoning must play a role? Part of the argument against many renewable technologies has been on aesthetic grounds, based principally on an 18thC view of an ideal ‘natural’ landscape. Although we need to continue to poke that model with a sharp stick, new technologies are also revolutionising what power generation looks and feels like. But beauty is more than skin-deep. Climate change is also an ugly scar on a social consciences. The environmental and health consequences of climate change, which disproportionately affect low-income countries and poor people in high-income countries, profoundly affect human rights and social justice. This, too, is familiar territory for artist-activists whose role is to challenge, question, and subvert. So this is a call to action for artists, designers, engineers and other thinkers to turn their attention to a world in need of a change of argument, one that can adorn our new biosphere not only with aesthetic pleasure but with a beauty of equality and social equity. The technological argument has been won; now it is time to win our hearts and make the world beautiful as well as clean. This list is neither prescriptive nor proscriptive and is a guid only. Please be free to submit any ideas you feel are relevant to the topic. The deadline for submission is 22.00 BST on Thursday June 7, 2018. We are requesting 250-word abstracts or outlines, which must be submitted through the event website at postcarbon.world/proposal-form/. We are unable to accept any submissions after the deadline. As the Paris Agreement moves into the implementation phase, climate adaptation enters into conversation with broader development goals, building upon and expanding traditional notions of sustainable development. We seek scholarly and applied research that explores the relationship between climate and development, broadly construed, spanning disciplines, and ranging between applied and theoretical works. Potential topics relating to climate and development are open but could include: emissions reductions strategies, projects that multi-solve for climate and poverty sustainable development goals, forms of knowledge in climate development, analyses pertaining to development issues negotiated in UNFCCC and other fora, climate development program implementation, metrics for assessing efficacy of climate development projects, multilateral climate development, multi-scale climate and development governance, and policy analyses. Participants will each workshop their article-length work in progress and work with a small, focused community of experts approaching this topic. Applications are due to Jessica O’Reilly at jloreill@indiana.eduby June 15. Applications should include a 200-400-word article abstract and CVs for authors. One author per article will be offered travel funding for the workshop. Participants should submit full-length articles (5000-10000 words) by September 7; articles will be read by workshop participants ahead of the event. Proposals for papers and/or exhibition materials are invited for Monsoon Waters, the second in a series of symposia convened by Monsoon Assemblages, a research project funded by the European Research Council (ERC) under the European Union’s Horizon 2020 research and innovation programme. We live in a world where political geography and spatial planning have assumed permanent and easily observable divides between land, sea and air. Land is understood as solid, stable, divisible and the basis of human habitation; the sea is understood as liquid, mobile, indivisible, and hostile to human settlement; air is understood as gaseous, mobile, invisible and indispensable to human life. The monsoon cuts across these divisions. It inundates lived environments every year, connecting land with sea and sky. It is a spatial practice that reorganises air, water, land, settlements, cities, buildings and bodies through heat, wind, rain, inundation, saturation and ow. It unites science with politics and policy with affect. Today climate change is disrupting its cycles and explosive social and economic growth and rapid urbanisation are increasing the uncertainty of its effects. How can spatial design and the environmental humanities respond to these conditions by drawing on the monsoon as a template for spatial theory, analysis and design practice? In order to deepen its responses to these questions, Monsoon Assemblages is convening three symposia between 2017 and 2019 framed by the states of matter connected by the monsoon - air, water and ground. Monsoon [+ other] Airs took place in April 2017. The second symposium, Monsoon Waters will take place on 12-13 April 2018. It will comprise inter-disciplinary panels, key-note addresses and an exhibition and aims to bring together established and young scholars and practitioners from a range of disciplines, literatures, knowledge systems and practices (theoretical, empirical, political, aes- thetic, everyday) to engage in conversations about the ontologies, epistemologies, histories, politics and practices of monsoon waters. Following Mathur and da Cunha [1} we are interested in contributions that explore wetness (in the air, on the earth, under the earth) as a way of being, cultures of wetness, and the urban, environmental and political consequences of attitudes towards being wet. We are interested in contributions that explore attitudes towards water in south Asia since the mid 1980’s, their history, their urban, environmental and political consequences and the ways-of-being-monsoon-water that these attitudes have produced, such as ood-water, de cient-water, toxic-water, beauti ed-water, bottled-water etc. We are interested in contributions that explore monsoonal cycles of wetness and dryness from the perspective of climate change, any changes in political, social or economic behaviour these might be catalysing and in new or invigorated social movements these changes might be inspiring. We are interested in contributions that explore ways of visualising monsoon cycles of wetness and dryness, (in the air, on the earth, under the earth) and their consequences for spatial design practice. Anuradha Mathur and Dilip da Cunha: architects, planners and landscape architects based in Philadelphia, USA and Bangalore, India, whose work is focused on how water is conceptualised and visualised in ways that lead to conditions of its excess and scarcity, and the opportunities that its ubiquity offers for new visualizations of terrain, and resilience through design. Kirsten Blinkenberg Hastrup: environmental anthropologist based in Copenhagen, Denmark, whose work deals with social responses to climate change across the globe, currently centered in the Thule Area, NW Greenland. Contributions are invited in response to these provocations. They should take the form of 150 - 250 word abstracts for either papers or creative, practice based contributions such as drawings, photographs, videos, performances, musical compositions etc. Enquiries or abstracts should be sent to Lindsay Bremner at l.bremner@westminster.ac.uk by 08 January 2018. Abstracts will be reviewed by the Monsoon Assemblages team and authors will be notified by 29 January 2018 whether their contributions have been accepted or not. There is no registration fee for the symposium, but participants will be required to secure their own funding to attend it. Participants will be requested to submit their contributions for publication in the symposium proceedings, or, potentially, a special journal issue. Action Research is inviting articles for the special issue: Climate Change and Action Research: Creating Transformative Knowledge With Stakeholders. This Special Issue aim to highlight the knowledge that Action Research can provide on themes related to social changes in a change climate. There is currently a large mis-match between goals and reality in climate change responses. Action Research is well position to provide co-created knowledge and insights on the relationship between knowledge and action, focusing on stakeholder engagement and diversity of expression. The Special Issue Editor is Hilary Bradbury and the editor team includes Steve Waddell; Marina Apgar; Tom Wakeford; Karen O’ Brien, Ioan Fazey, Rik Peters, Benito Teehankee. Papers due to ARJ January 30, 2018. How do action researchers generate transformative knowledge creation within a domain that has been largely dominated by conventional natural sciences and economics? How can action researchers and conventional scientists work better together to navigate the power and politics of scholarship to realize epistemological complementarities required for meaningful outcomes? How can conventional science’s research designs be re-designed/complemented/influenced by Action Research design? How do subjective & intersubjective knowledge claims interweave with objective knowledge claims in a way that furthers a transformative change agenda in response to climate change? How are the material differences of specific spaces and places to be accounted for in what needs to be a global transformation? What are relevant examples and exemplars of transformative knowledge from which we can learn? How is indigenous knowledge, traditional knowledge, knowledge democracy, and other ex- cluded epistemologies to be included? What is required for good exemplars of action research that link across scale (e.g., between a community base and institutionalizing powers)? How do we develop truly integrated efforts that are actionable - combining the exteriorizing focus of systems thinking with the interiorizing focus on relationships, gender and racial power dynamics (etc) that can allow for authentic transformation to happen? What happens when more attention is given to convening convivial and purpose-driven rela- tional spaces as a prelude to transforming behavior, i.e., spaces that balance between agency and community to avoid the dulling of the radical spirit of transformation that many change agents carry? What does planning look like in transformational efforts? How different is it from conventional ideas of planning in related spaces (such as international development)? Many action re- searchers assume planning needs to be more emergent and generative, but what does that really mean in practice? To read more about the call for papers click here. of climate change-related adverse weather events and natural disasters. Sustainability strand for academic and policy audiences. could analyse, please let us know asap. The weather plays an often underestimated, yet vitally important role in human history. Climate has been considered an explanation for almost every aspect of society and culture, from causing disease to determining racial characteristics historically. Extremes of weather, especially those experienced in Asia including typhoons and monsoon rains, have also had a major impact on society. In urban areas, the weather has contributed to urban destruction and shaped resultant urban rebuilding and planning. In the port and coastal cities of Asia, the need to understand those extremes also led to pioneering scientific developments in the fields of meteorology and maritime science. In the modern Anthropocene, the need to understand the history of the climate and all its associated impacts is ever more critical. Climate and weather history are still considered emerging fields despite some precedent from the sciences and arguably, studies in this field have disproportionately favoured Northern Europe, in large part because of the greater availability and accessibility of records for this region. There are still many knowledge gaps for Asia however, partly because of the paucity of records in comparison to Europe, because many archives have either been restricted or have only relatively recently been opened, but also because regional scholars have overly focused on teleological nationalistic explorations of the past. The aim of this conference therefore is to explore the role of the weather in the history of anthropogenic Asia. It ties in with current historiographical trends that explore scientific history as a globally linked enterprise, one that crossed different national and imperial borders. It also sees Asia as critical to the development of global meteorological science: understanding extremes such as typhoons were essential to trade, economy and society. Despite the centrality of extreme weather to urban Asia historically (and in the present day) however, this field remains relatively under researched. The panels adopt an interdisciplinary approach, appealing to historians, social scientists and natural scientists with an interest in events and trends in the history of climate changes and extremes of weather, to suggest what an enhanced understanding of the past might teach us about managing and adapting to current climatic challenges. This helps us to fill a gap between different disciplines, especially meteorologists and scientist who are more concerned with quantified data and historian and/or social scientists who put more emphasis on socio-political aspects of climate and climate change. Please submit your proposal, using the provided proposal template to Dr Fiona Williamson at ariwfc@nus.edu.sg and Sharon at arios@nus.edu.sg by 17 October 2017. Notifications of acceptance will be sent out by 17 November 2017. Wednesday 28 February and Thursday 1 March 2018, University of Leeds. This two-day workshop seeks to critically rethink how design and environment inform each other. Architects, designers, and environmental scholars from a range of disciplines are committed to sustainability. However, the relationships between these fields of inquiry and production are not self-evident. How are design and environment intertwined, or when does environment become design and vice versa? It has long been recognised that spatial planning and design are not just matters of aesthetics or convenience, but can have major consequences for how an environment functions in social terms. The examples of destructive socio-spatial segregation are ample, as are those of fragmented ecosystems. The workshop invites reflections on the troubled relationship between design and environment beyond conventional “Design for the Environment” (DfE) frameworks (focussing on the environmental impact of products or processes) and seeks to defy the idea that design altruistically works ‘for the betterment of all’. Acknowledging instead the normativity and embeddedness of design in power structures, can serve to expose the intentionality of environmental changes. In turn, environmental changes, as well as contemporary understandings of the socio-material configuration of space, can produce surprising understandings of how design processes work and allow for more inclusive, and perhaps empowering conceptualisations of design. The emerging field of design anthropology in particular has been “concerned with how people perceive, create, and transform their environments through their everyday activities” , thus developing a broad conceptualisation of design as a way of making the world. Where do (studies of) design and environment meet, and what kinds of understandings does this offer? What are the pitfalls and challenges this encounter brings forward? How do the temporalities and materialities of design and environment align or clash in working towards a sustainable future? This will be an intensive, interdisciplinary and output-oriented workshop. Apart from public keynote lectures by Wendy Gunn (KU Leuven) and Clare Rishbeth (The University of Sheffield), the workshop will be closed to people who are not presenting to improve commitment within the group. The workshop is limited to a maximum of 20 people. Those interested are kindly asked to send an abstract (max 200 words) outlining their ideas to Arvid van Dam (a.vandam@leeds.ac.uk) before 13 October 2017. Invited participants will then be asked to submit a 3 to 5 page essay well before the workshop and all participants are expected to read the essays in their panel. In addition, they will be asked to send 1 to 3 thematic questions with their essay, which might inform the panel discussions. During the meeting, each participant will give a pitch rather than a full presentation, focussing on the main argument of their essay (creative approaches are welcome), and allowing for in-depth discussions. There will be no parallel panels. Various sessions will be directed, each in their own way, at coming up with collaborative output based on the discussions and presentations. Gunn, W., T. Otto & R.C. Smith (2013). Design anthropology: Theory and practice. London, New York: Bloomsbury. (Page xiii). take place at Denmark's Moesgaard Museum on December 6th and 7th, 2017.
mdv27@cam.ac.uk) by November 1, 2017.
reality adds new layers of complexity and intensity to this story. chart a path forward for the museum as a powerful force for world-making. death being muddled—whether intentionally or not—and with what consequences? of loss, profusion, and transformation within their approaches? otherwise rechannel these questions and projects? We are calling for papers for our panel Engraved in the rock and dissolved into air: the phenomenology of living in a human-induced climate, which forms part of the forthcoming AAS/ASA/ASAANZ Shifting States Anthropology conference in Adelaide, Australia, 11-15 December 2017. The panel will explore thevalue of incorporating a phenomenological analysis into the study of climate change. Papers that examine—conceptually or empirically—the lived experience of climate change are sought. How has the transnational climate governance arena evolved since Paris 2015? What new barriers have arisen as a result of austerity, populism, Brexit and Trump? How might they be addressed? What are the prospects for international climate politics without US involvement in the Paris Agreement? Does the changed context create any new opportunities as well? What are the (new?) roles of scientists / experts / activists / citizens in today’s climate politics? Contributions are invited that deal with these or related questions in relation to climate politics at all levels – local, regional, national, trans- and international –, focussing on different types of actors and specific issue areas, and from all relevant disciplines, whether empirical or theoretical. We particularly invite contributions and participation of postgraduate students and early career researchers. Some funding is available to help support travel expenses for postgraduates and early career researchers on fixed-term contracts; please just include a note outlining why you would need to draw on this with your abstract submission. A grant writing clinic specifically geared towards environmental research. Those interested in presenting a panel paper should submit an abstract of 300 words max. ; those interested in taking part in the practitioner roundtable should submit a brief outline of their role and the position/themes they would wish to speak about, also of 300 words max. Please submit your abstracts or outlines to Marit Hammond (m.hammond@keele.ac.uk) by Monday 10 July 2017. NOTE: the call for papers is closed for this conference, but they are open for registration. Robert Van de Noort, author of Climate Change Archaeology, to give keynote address, "The Resilience of Past Communities in their Responses to Climate Change", at 5pm on Friday, 7 April, to be followed by a drink reception. This stream poses the question of what role materials of different kinds play in contemporary organization. The organization of matter is central to the work of business and management. From the extraction of oil, coal and gas in the energy industries, to the use of minerals in mobile phone and computer chip development, from the pressure to reduce the levels of carbon dioxide and other greenhouse gases in the face of climate change, to a move towards thinking in terms of resource efficiency and ethically sourced products, organizations must grapple with the appearance, force, value and power of materials and their properties. This panel invites papers that take as an ethnographic focus the role that materials play in processes of organisation. We are interested in exploring how materials such as concrete, carbon, nuclear waste, water, sand, fabric, gold, energy, data or metal come to matter within the context of contemporary business and management? What is being done to materials within the context of contemporary organization and what are materials in turn doing to economic and political relations? How does the status of materials change as resources come into confrontation with health and safety, risk, conservation, and the repurposing of materials to new ends? What happens to organisation when materials are combined, made multiple, compound or hybrid? What are the technical, social and imaginative means by which materials come to participate in social worlds? How are materials known, interrogated, and responded to? And what are the challenges now being posed by new materials such as nanotechnologies, smart fabrics, or sensory matter? By viewing organization through an attention to materials, this panel will ground the issue of uncertainty that this symposium aims to address in a materialist paradigm. It will offer a means of interrogating futurity, risk, anticipation and visions of the future via the affordances, tendencies and resistance of matter as it moves in and out of meaning and in and out of place. Please submit a 250 word abstract to h.knox@ucl.ac.uk<mailto:h.knox@ucl.ac.uk> by February 28th 2017. *November 15-18, 2017 - Universidad Diego Portales, Santiago - Chile*. change and catastrophe are proliferating in a world in flux and crisis. knowledge practices and demand different modes of collaborating and acting. maker communities and other forms of p2p practitioners are also encouraged. the section and to engage with the conference location. if not in Spanish or English they must include subtitles. all proposals anonymously and communicate results by the due date. Scholarship on weather and climate change beyond meteorology is currently disunited. Weather Matters is a place for opinions, debate, reviews. 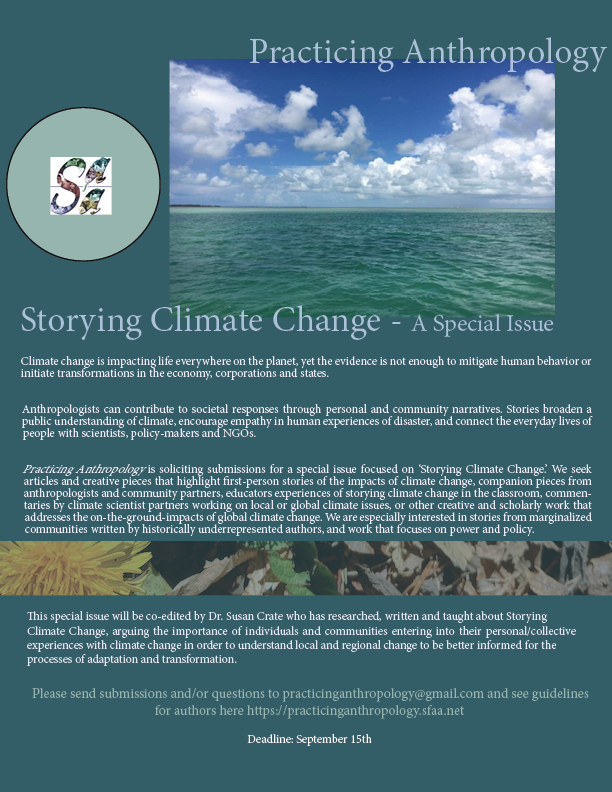 Join us, whether it's with a conference or book review, an opinion on where we should be focusing our efforts in understanding what climate change means for humanity, a piece of writing that didn't quite fit in a thesis or article but might still be interesting to colleagues, or some expressive visual or audio material. Interdisciplinary Perspectives on Equality and Diversity (fully OA) is seeking submissions on intersectionality and climate change. We particularly welcome explorations of how categories of difference intersection to further understanding of the effects of climate change, and efforts to mitigate such effects. Submissions may explore gender, disability, race, ethnicity, social class, migration, sexuality, poverty, nationality. We welcome papers in English, German, French, and Thai. We may be able to accept papers in other languages (including American/British/International sign language) - please contact me (Kate k.sang@hw.ac.uk) for further information. IPED seeks to challenge dominant paradigms of research, including drawing on theories outside the Western canon and alternative forms of presenting research. The deadline for this call is the end of January 2017.